Here’s a mouthwatering rum cake to indulge your sweet tooth that’s made with Caliche Rum – an aged white Puerto Rican rum – for a bit of an extra kick. Serve it to your guests or keep the whole thing for yourself. Either way, there are sure to be lots of smiles. Enjoy! Position a rack in the middle of the oven and preheat to 350°F. Make the glaze and pineapples:. In a small saucepan over moderate heat, combine the brown sugar and 1 cup rum, and bring to a simmer. Continue simmering, stirring occasionally, until reduced by about 1/3. Whisk in the butter. Add the pineapple slices, gently stirring to coat them in the glaze, then let them sit for about 3 minutes. Transfer the pineapple slices to the bottom of a 9-inch square cake pan, arranging them to cover the bottom. Save the rum glaze for serving. In the bowl of a stand mixer fitted with the paddle attachment, combine the butter and sugar and beat on high until light and fluffy, about 3 minutes. Add the eggs, one at a time, and beat on medium until fully incorporated. Add the vanilla and rum, and beat for 30 seconds. Fold in the flour and salt. Scrape the batter (it will be thick) over the pineapples in the pan. Sprinkle the pecans over the batter and bake until a tester inserted in the center comes out clean, about 1 hour and 10 minutes. Let the cake cool on a rack for 15 minutes then flip it onto a serving plate so that the pineapples are on top. Note, this cake can be baked in advance, covered, and kept at room temperature up to 10 hours. In a small saucepan over moderate heat, combine the rum glaze and the remaining 1/2 cup rum and warm until heated through. 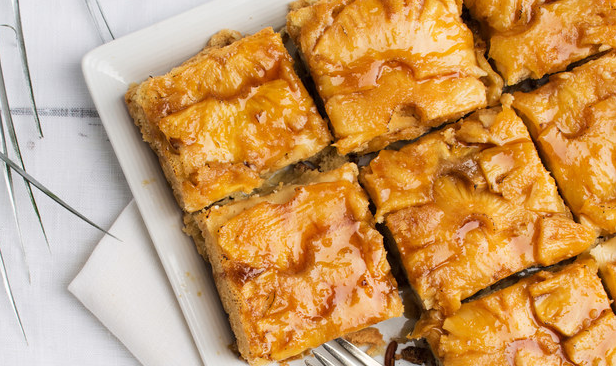 Cut the cake into squares and serve with vanilla ice cream and warm rum glaze.